1 vial: 500 mg Inj. 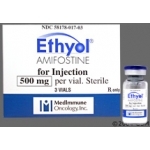 Natfost (Amifostine) by Natco is generic version of Ethyol. Reducing kidney damage due to cisplatin chemotherapy in patients with ovarian cancer. It is also used to reduce moderate to severe dry mouth associated with radiation treatment after surgery for head and neck cancer. It may also be used for other conditions as determined by your doctor. Natfost (Amifostine) is a cytoprotective agent. It works by removing certain substances that cause damage to the kidneys. It also reduces some harmful effects of radiation on healthy tissues. Some MEDICINES MAY INTERACT with Natfost (Amifostine) . However, no specific interactions with Natfost (Amifostine) are known at this time. Ask your health care provider if Natfost (Amifostine) may interact with other medicines that you take. Check with your health care provider before you start, stop, or change the dose of any medicine. 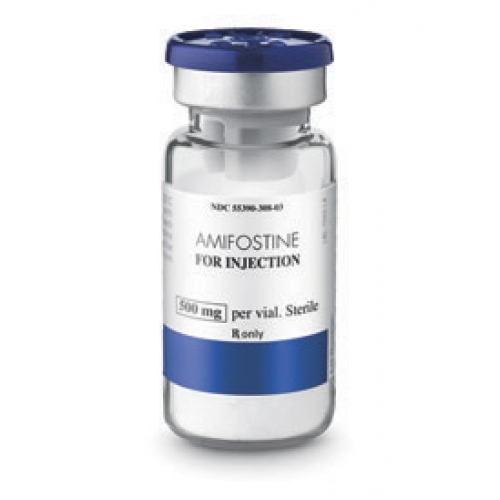 Use Natfost (Amifostine) as directed by your doctor. Check the label on the medicine for exact dosing instructions. 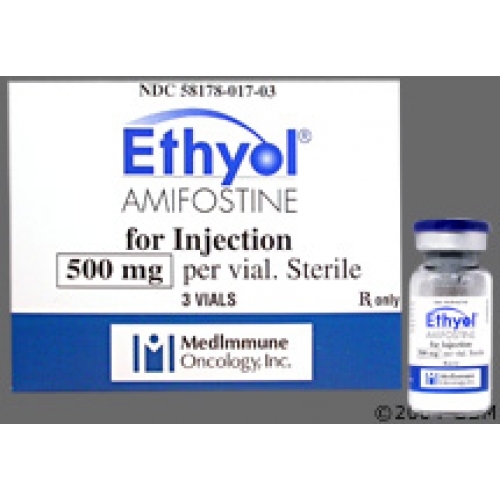 Natfost (Amifostine) is usually given as an injection at your doctor's office, hospital, or clinic. If you will be using Natfost (Amifostine) at home, a health care provider will teach you how to use it. Be sure you understand how to use Natfost (Amifostine) . Follow the procedures you are taught when you use a dose. Contact your health care provider if you have any questions. Patients who take blood pressure medicines may need to avoid taking them within 24 hours before or after using Natfost (Amifostine) . If you take medicine for high blood pressure, ask your doctor how to take it along with Natfost (Amifostine) . Do not use Natfost (Amifostine) if it contains particles, is cloudy or discolored, or if the vial is cracked or damaged. If you miss a dose of Natfost (Amifostine) , contact your doctor right away. Ask your health care provider any questions you may have about how to use Natfost (Amifostine) . Natfost (Amifostine) may cause dizziness or drowsiness. These effects may be worse if you take it with alcohol or certain medicines. Use Natfost (Amifostine) with caution. Do not drive or perform other possibly unsafe tasks until you know how you react to it. Natfost (Amifostine) may cause low blood pressure. If you experience dizziness, shortness of breath, difficulty breathing, seizures, fainting, or decreased urination, contact your doctor immediately. Patients who take blood pressure medicines may need to avoid taking them within 24 hours before or after using Natfost (Amifostine) . If you take medicine for high blood pressure, ask your doctor how to take it along with Natfost (Amifostine) . Severe and sometimes fatal skin reactions have occurred with Natfost (Amifostine) . This reaction may develop even weeks after you start treatment. The risk may be greater in patients who use Natfost (Amifostine) to reduce dry mouth caused by radiation treatment. If you experience severe rash (eg, redness, scaling, swelling, peeling, or blistering of the skin), fever, mouth sores, or red and irritated eyes, contact your doctor right away. If you experience nausea or vomiting, talk to your doctor about how to avoid becoming dehydrated. Your doctor may prescribe medicine to help decrease nausea and vomiting that may occur while you are using Natfost (Amifostine) . Lab tests, including kidney function, blood calcium and electrolyte levels, and blood pressure, may be performed to monitor your progress or to check for side effects. Be sure to keep all doctor and lab appointments. Use Natfost (Amifostine) with extreme caution in CHILDREN; safety and effectiveness have not been confirmed. PREGNANCY and BREAST-FEEDING: It is not known if Natfost (Amifostine) can cause harm to the fetus. If you become pregnant, contact your doctor. You will need to discuss the benefits and risks of using Natfost (Amifostine) while you are pregnant. It is not known if Natfost (Amifostine) is found in breast milk. Do not breast-feed while taking Natfost (Amifostine) . Drowsiness; feeling of coldness; flushing/feeling of warmth; hiccups; nausea; sneezing; vomiting. shortness of breath; sores on the lips, mouth, or tongue; sudden, severe headache; unusual fatigue or tiredness; vision changes.
. Symptoms may include seizures; severe or persistent dizziness; shortness of breath. 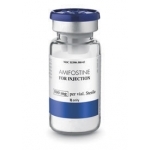 Natfost (Amifostine) is usually handled and stored by a health care provider. If you are using Natfost (Amifostine) at home, store Natfost (Amifostine) as directed by your pharmacist or health care provider. If you have any questions about Natfost (Amifostine) , please talk with your doctor, pharmacist, or other health care provider. Natfost (Amifostine) is to be used only by the patient for whom it is prescribed. Do not share it with other people.